"Fleur" stands for "flower" in french and I thought TFL's catalogue matched the description of a beautiful dainty flower perfectly. Here are 3 looks I created with them and I hope you guys like it! The moment I heard about TheFleurLabel , I got drawn immediately to its name because France is a place that I hold very dearly to my heart. And because I took a basic french class while I was on exchange in France, I've always thought that the word 'fleur' sounded so feminine and elegant. A baby powder blue top is bound to soften any look up. This top is not only soft, comfy and flattering because of the thin straps on the shoulders, it is also double-lined to make sure they bring the best quality to you. Pair it up with a skater skirt and sneakers for a casual, sk8ter gal look. Or to step up the glam level, throw on a statement necklace and some bling. Gracia is a piece that is perfect for this crazy weather we live in. The cutouts are flattering, but at the same time so subtle. If you're a girl that have always been eyeing on cut out pieces but have never had the guts bare them all, this sweet little dress is the one I would recommend. Choose between black or navy for this look! Culottes are so fascinating and even though the culottes trend has been out for so long now, i still see myself gravitating towards it. Simply because it is so darn comfy. 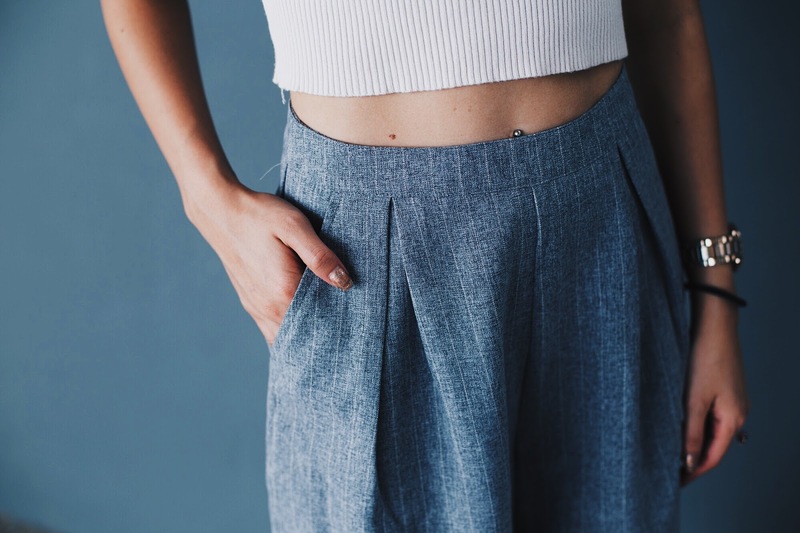 The wide leg characteristic of a pair of culottes give your legs a slimming illusion, and most culottes I see in the market are either black, or solid coloured. Who would say no to a little stripes and grey colour?